My recent Recession Red tasting event seems to have opened peoples eyes and minds to the great buys to be had in the land of ten dollar wines. I’m seeing more acceptance, even respect, for ‘cheap’ wine. In the past low prices usually signified low quality – but not anymore. Today some good wine producers are deliberately selling low. Large wineries from countries short on prestige have no option but to sell at everyday prices. For them, their small margin per bottle ends being worthwhile because of volume sales. Owners of small wineries often admit to me that the competition’s ten dollar Chardonnay is as good as their fifteen dollar wine, but they “can’t match that price”. The best example of selling low is Chile. Almost every Chilean wine on our shelves is under priced. The really good stuff is way under-priced, for example, the following pair from Carmen. 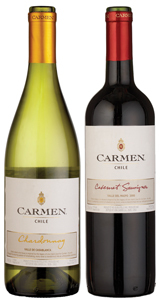 Carmen 08 Chardonnay not only feels rich and luxurious but is also full of vitality. Glamour combined with a pure, fresh feeling. The Nicole Kidman of Chardonnay, and a great date for ten bucks. Pair it with a roast chicken from the Chalet and you’re all set. Carmen’s Cab is also star quality. Immediately you’ll sense its rich and warmhearted nature, and as you engage it, a dry, French styling unfolds. Cabernet is, after all, a French grape variety. 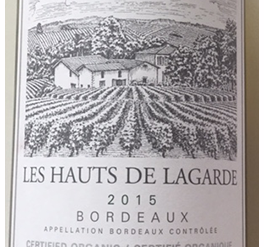 An air of formality makes it feel classier than most everyday priced reds from warm climates. I suggest steak frites, or le hamburger. Complete the Bistro feeling with a checkered tablecloth. Santé.